In his thirty year career, Graham Parker has earned his reputation as a memorable songwriter capable of writing witty, angry lyrics. 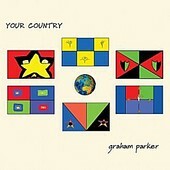 Brought up in the pub-rock scene of England, Graham Parker's latest record, Your Country, moves away from the pub rock (though its mark can always be heard), and moves into the roots-rock arena, as it more than clear on songs such as the rollicking "Queen of Compromise" and the honky-tonk "Tornado Alley". But the album also has another side, blues-influenced roots of "Anything for a Laugh" and "The Rest is History". Parker says, in the liner notes, that The Stones have taught him that country is really just the blues, and he applies that to Your Country, delivering a record that is clearly roots-based, but doesn't try too hard to be country, and, as a result, comes out as an at-ease, relaxed, folk-laced record that lives up stronger to the country values brought forth by the likes of Hank Williams Sr. than most country albums today. I'll give it a B+.